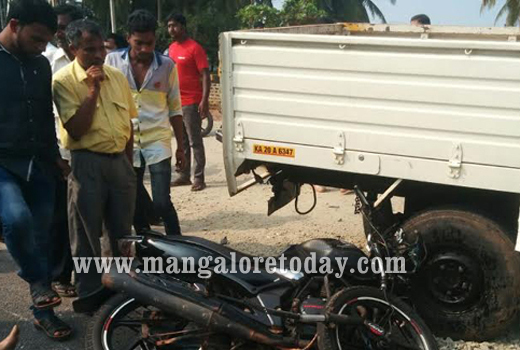 Kundapur, Oct 25,2016 : A head-on collision between a motor bike and a Mahindra pick-up vehicle at Bijur near Byndoor on October 25, Tuesday has claimed the life of a bike rider. The deceased has been identified as Guru Poojary (32), son of Annappa Poojary from Yadthare, near Byndoor. Eyewitnesses said the bike rider was zooming forth at great speed and collided with the pick-up vehicle while trying to overtake a bus. The deceased was working as a bus driver. Traffic on the National Highway was affected for some time owing to the mishap. Byndoor Police have registered a case.